This puzzle is a cube which is built from smaller cubes, 5 to an edge, i.e. a 5×5×5 cube. Each slice can rotate, which rearranges the small cubes on the surface of the puzzle. The six sides of the cube are coloured, so every corner piece shows three colours, every edge piece shows 2 colours, and every face centre only one. Like the normal 3×3×3 Rubik's cube, each face has a centre piece which never moves from its spot, so these can be used as a fixed reference point, showing what colour each face should be. The first mass-produced 5×5×5 cube mechanism was the one patented by Udo Krell on 15 July 1986, US 4,600,199. This leaves 8!·24!3·12!·37·210/4!12= 282,870,942,277,741,856,536,180,333,107,150,328,293,127,731,985,672,134,721,536,000,000,000,000,000 or 2.8·1074 positions. If you can distinguish the centre pieces from one another, then there are two extra parity constraints. The number of positions is then 8!·24!3·12!·37·28= 2,582,636,272,886,959,379,162,819,698,174,683,585,918,088,940,054,237,132,144,778,804,568,925,405,184,000,000,000,000,000 or 2.58·1090 positions. Meffert's page. The solution provided in its booklet. Matthew Monroe's Page Solves centres, pairs up edges and solves as cube. Like the normal cube, there are several types of solution. I will give some examples here, and point out the advantages and disadvantages of each. Let the faces be denoted by the letters L, R, F, B, U and D (Left, Right Front, Back, Up and Down). Clockwise quarter turns of a face layer are denoted by the appropriate letter, anti-clockwise quarter turns by the letter with an apostrophe (i.e. L', R', F', B', U' or D'). Half turns are denoted by the letter followed by a 2 (i.e. L2, R2, F2, B2, U2 or D2). The above is the same notation as for the 3×3×3 cube. There is however a new type of move. The internal slices will be denoted by the lowercase letters l, r, f, b, u and d, and the type of move is shown in the same way as normal face moves. Note that these letters mean the slice adjacent to the faces only, so such a move will not disturb the corners or the face centres of the cube. Occasionally we will want to rotate the central slice, the one parallel to the floor, between the u and d slices. This will be denoted by the letter m, where the direction of the move is as seen from above, so the moves m and u both move in the same direction. I will not give a solution that solves this cube in layers (i.e. top centres, top corners/edges, middle centres/edges, bottom edges/corners). 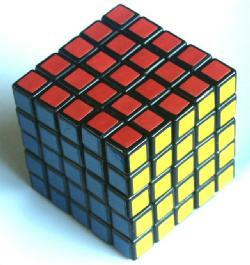 For a cube this size it is slow, and impractical compared to the other types of solution. Solution 1: Corners first method. Phase 1:Solve the top layer centres. First use slice moves to solve the inside edge pieces, i.e. form a small cross inside the U face. This is easy, so I will not elaborate. Turn U to place a wrong inside corner piece at the fr position. Find an inside corner piece that belongs in the U face. Repeat b-d until all the top inside pieces are correct. Phase 2: Solve the bottom layer centres. Find an inside edge piece that belongs on the bottom face. Hold the cube so that it lies in the front face and turn F to bring it to the u layer. Rotate D to put an incorrect inside edge to the r slice, and then do rFr' to replace it. Repeat a until all four inside edges of the D face are correct, i.e. it shows a small cross. Find an inside corner piece that belongs in the D face. Hold the cube so that it lies in the front face and turn F to bring it to the r and u slices. Rotate D to put an incorrect corner at the fr position, and do urB'uBr'. Repeat d until the bottom centre is finished. Phase 3: Solve the corners. Use any method you like. If you use a method for the mini cube, then turn the corners afterwards to match the top and bottom centres. Phase 4: Solve the edges in the U/D layers. Note that this phase is a combination of the corresponding phases in the solutions for the 3x3x3 and 4x4x4 cubes. Find one of the three edge pieces that belongs at UF. If it does not lie in the middle layer then rotate the whole cube around the U/D axis to bring it to the front face and do FuF', FmF' or Fd'F' where you use the sequence that move the slice containing the edge. It should now lie in the middle layer. 1. To move BRu to UFl, do FuF'. 2. To move BR to UF, do FmF'. 3. To move BRd to UFr, do Fd'F'. 4. To move BRu to UFr, do F'u2F. 5. To move RB to UF, do F'm2F. 6. To move BRd to UFl, do F'd2F. Find the edge piece that belongs at DF, in the same slice as the piece that you just placed. If it is already in position but upside down, then do FmF'mF'mF to place it correctly. Note that the DFr and DFl pieces cannot be upside down. If it seems that way, then it is simply the other identically coloured piece that belongs there. If the piece you have found is in the bottom face then rotate the whole cube around the U/D axis to bring it to the front face and do Fu2F', Fm2F' or Fd2F' to bring it to a middle layer. 1. To move BRu to DFl, do F' u'd F2 u'F'. 2. To move BRd to DFr, do F' u'd F2 d F'. 3. To move BRu to DFr, do F d' F2 u F.
4. To move BRd to DFl, do F u F2 d'F. 5. To move BR to DF, do m' F m F2 m F.
6. To move BR to DF, do F' m' F2 m'F. Repeat a-d for each pair of edges in the U/D layers. Phase 5: Solve the middle layer edges. Rotate d to place as many pieces correct as possible. 1. To move FLu->FRd->FLd->u layer, do uF2u'F2. 2. To move FLu->FRd->u layer, do F2uF2uF2u'F2. If there is no d piece in the u layer then use and u piece to displace incorrect d pieces. Rotate m to place the centres correct. 1. To swap FR-BL, FL-BR do m L2R2 m' L2R2. 2. To swap FR-BR, FL-BL do R2 m2 R2 m2. 3. To cycle FL->FR->BR->FL do R2 m' R2 m.
4. To cycle FR->FL->BR->FR do m' R2 m R2. 1. To flip FR and BR do RM'RM'RM'RM2 RM'RM'RM'R. 2. To flip FL and BR do RM'RM'RM'RM RM'RM'RM'RM. 3. To flip FR, FL, BR, BL do BUB' Rm'Rm'Rm'Rm' BU'B'. 1. To cycle Fur->Rub->Bur->Lub->Fur do r2ur2u'. 2. To swap Fur-Rdf, do rf'r'Frfr'F'. These sequences do move other centres, but do not move others from the pair of faces where they belong. You may have to turn the cube, and turn some faces to get the pieces you want to move into position for the sequences to work, and turn the faces back afterwards in the opposite order. Repeat until the pieces are separated. Hold the cube so that the F and B inside corners need to be solved. If only one inside corner is wrong on each of the two faces, then turn F so that the two wrong pieces are not in the same u/d layer but are in the same l/r layer. If the faces each have three inside corners wrong, then turn F so that the two correct pieces are not in the same u/d layer but are in the same l/r layer. If the faces each have two inside corners wrong, and they are not adjacent in either face, then turn F so that the wrong pieces lie in the same slices as those of the B face. If the faces each have two pieces wrong, and at least one pair is adjacent, then turn F and/or B so that the adjacent wrong pieces both lie in the u layer. Then do u2r2u2r2 and turn F and B back again if necessary. Repeat this also for the L/R faces. Phase 7: Solve the inside edges. For this phase we need a bit more notation. Let n denote the middle slice between l and r.
1. To cycle Fu->Ru->Bu->Lu->Fu do n2un2u'. 2. To swap Fu-Ru,Fd-Rd, do Rm'B' u2n2u2n2 BmR'. 3. To swap Fu-Ru, do Rm'd'B' u2n2u2n2 BdmR'. These sequences may move other inside edges, but do not move others from the pair of faces where they belong. Repeat this until the two sets are separated. 1. To swap Fu-Bu, Fd-Bd, do u2n2u2n2. 2. To swap Fr-Br, Lb-Rb, do r2mr2m'. There is one more type of algorithm which is especially effective on this cube. It involves putting the centres correct, joining up edge pieces, and then solving it as if it were a normal 3×3×3 Rubik's cube. It is relatively simple, as only a few new sequences are needed. The method below solves the F centres without disturbing any already solved faces. Simply repeat this for each of the faces. 1. For a piece at Bu do u2Fu2. 2. For a piece at Ru do u Fu'. Repeat a to put all the inside edges of the F face correct. 1. For a piece at Bur do u2B'u2B'u2B2u2. 2. For a piece at Ruf do u'R'u R'u'R2u. Repeat c to put all the inside corners of the F face correct. Repeat a-d for each of the faces. Phase 2: Join up the edges. Find any central edge piece and any other edge piece that has the same colours, but which are not yet adjacent. Use any face moves (no slice moves) to place them in the m and u layers respectively. Make sure that the central edge piece is oriented in such a way that a move of the u layer would line the two pieces up correctly. Use any face moves to place an unmatched edge piece at the FUr position. Give priority to those triplets where the FUr piece has the same colours as its adjacent central edge, but where the central edge is upside down. If you cannot find any other unmatched edge, then do the sequence R2uR2uR2uR2uR2uR2 and try again. Rotate u, and m to line the three edges up at the FR position. Do RU'R' and then turn u back so that the centres match again. Repeat a-d until all edges have been joined up into triples, or until you can no longer find three sets of triples that are not matched. Phase 3: Solve the cube. Solve the cube with face moves only, using any method for the 3x3x3 cube. This is always possible. The exceptional cases that occur with the 4x4x4 cube will not happen because the central edges have already forced the other edges to be in a solvable position.